Our check-in was quick and there were no complications. Our cabin exceeded our expectations, as when we booked we were not to be provided linens or a tv; new owners chose to provide these, to our surprise. Though we did not use the television, we did appreciate that clean sheets, blankets, and pillows were provided. We had light, a/c, a ceiling fan, a clean refrigerator, and two sturdy bunk beds, as well as a screened porch, picnic table, and fire ring. Clean and well-lit bathrooms were nearby. Clean laundry facilities were on the grounds. We were located in town near grocery stores, restaurants, etc., but no noise bothered us. It was a great stay! The location was PERFECT for moab at night and for going to Arches during the day. 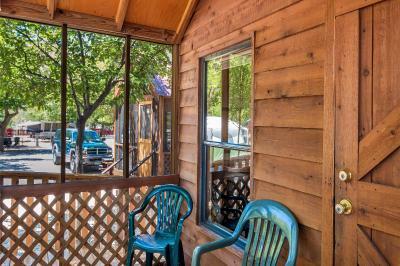 It is literally within walking distance of all shops and rest downtown main street Moab. location of campground was good, bathhouse clean, laundry facility available at convenient hours, access to small camp store within walking distance. Overall a really nice campground. The bathroom was located conveniently in relation to our cabin. Everything was in close walking distance within the campground. The air in the cabin was nice to have. It was also nice to dip our toes in the small pool near the front of the campground. The cost was very attractive. Location was great but Main St. is very busy and noisy. Clean bathrooms was most appreciated. In town. But still quiet. While we were there, Everybody was very respectful and quiet. Very convenient location. Lots of mature trees. Clean facilities. Location in Moab is great! The facility was always clean. The staff was friendly. Canyonlands RV Resort & Campground This rating is a reflection of how the property compares to the industry standard when it comes to price, facilities and services available. It's based on a self-evaluation by the property. Use this rating to help choose your stay! Canyonlands RV Resort & Campground is located in Moab. Guests can enjoy a seasonal outdoor pool. Arches National Park is 10 minutes’ drive from the property. Select RV pull thrus feature water and electric services at Canyonlands RV Resort & Campground Moab. Tent sites offer a fire pit and water services and the cottage includes a cable TV and a seating area. Moab Canyonlands RV Resort & Campground barbecue facilities are available. Dead Horse Point State Park is 45 minutes’ drive from the property. Canyonlands Field Airport is 19 mi from Canyonlands RV Resort & Campground. When would you like to stay at Canyonlands RV Resort & Campground? This bungalow has a patio and air conditioning. This bungalow features a patio and air conditioning. House Rules Canyonlands RV Resort & Campground takes special requests – add in the next step! Canyonlands RV Resort &amp; Campground accepts these cards and reserves the right to temporarily hold an amount prior to arrival. Canyonlands RV Resort & Campground accepts these cards and reserves the right to temporarily hold an amount prior to arrival. Please note that the property does not accept 5th wheels over 30 feet. Contact the property for more information. Canyonlands does not provide any towels. As the row between the cabins and bathroom seemed to be for short-term RV use, we usually had to walk around that row to access the bathrooms to avoid cutting through someone's space. A mid-row walkway would have been welcome, but it really was not a problem. Location Good facilities Awesome people! A microwave in the room could be a nice addition. The cabin were very nice. Provide a good alternative to hotels in Moab. Needed to check the bathrooms more than once a day. They got dirty because of the volume of people. Wonderful location. We stayed in a cabin, which was simple but clean and very comfortable. Staff were very helpful. Pool and small spray area for the kids were great. Shower was only 3 for women and it was always busy as places was quite full and lots of people. It wll be nicer if shower was bit more cleaner. Great location and quiet place for staying with average facility. Swimming pool was great facility though after coming back from hiking at Arch national park in heat. Loved the cabin. The facilities (showers, restrooms and laundry) were all clean and well looked after, as was the campground in general. Rare to see a campground that’s actually close to the city center - and was yet far enough from the road that there was little to no traffic noise, especially at night. Very welcoming staff too! Busy in the pool. I think sheets and pillow could be provided to make the stay more comfortable for people who do not always stay on campsites and thus have to buy them for one time use. Lovely cottage. Little porch with nets to protect from bugs (lots of wasps during dinner). A/C inside and tv. Clean shower. We couldn't see anywhere where it stated that linen was not supplied. We had to go out and buy sheets towels etc which added to the cost. The lady at the front desk ( Santa???) was so helpful. Cabin units and tent/RV sites a little too close together without convenient paths designated to reach bath house. The one toilet in the men's bathroom kept getting clogged. The campground is also tucked away, so if you're not looking for it, you may miss it. Finally, it is near a high school football field/track - there were no events going on while we were there, but could imagine it would be quite noisy if there were. Maybe have one or two more showers in the center bathroom. Very clean and in a great location (we loved being in the middle of town)! The only downside is they couldn’t get us into the same cabin for both nights of our reservation. It was a pain to check out and check back in hours later. It seems they could have been more accommodating, like being willing store our cooler or luggage, so we didn’t have to drive around w it between 11 and 3. Just check that your cabin is the same for all nights. All roads round the site were small stones.